Isabella had her stem cells transplanted back into her today. These were the stem cells that were harvested from her from the last couple of months. I've learned a lot over the last few months and added a few more things on Saturday as I watched her get the procedure. Stem cells in general are special cells that can divide and turn into other types of cells. The peripheral stem cells that she received can turn into any type of blood cells. This is different from embryonic stem cells which can turn into any other cell including spinal cord or brain cells and the cause of many passionate debates. Once the stem cells are transplanted, it takes about 11 days for them to travel through the blood stream and to the bone marrow in her hip where they will hopefully implant themselves and begin dividing to create new blood cells. After her stem cells were harvested, they were frozen and stored away. They added a preservative to the blood increase the viability of the cells while they are stored. When the patient is ready to receive the stem cells, the blood is thawed and put into a giant syringe and pushed through a central line (in this case, through Isabella's port). While the blood was being transplanted into Isabella, an interesting thing happened. Even though the push is happening through the port, Isabella got a very strong, weird taste in her mouth. This common occurrence happens because of the preservatives in the blood. The taste was so strong, that for the 10 minutes that the blood was being pushed, Isabella got extremely nauseous and vomited and had to spit several times. The doctors warned us of this ahead of time and we were prepared with lollipops to try and negate the taste, but it only helped a little. The really weird part to watch was that within a couple minutes of the syringe being emptied, Isabella felt better and perked right up. So for now, we'll remain in isolation for at least a couple more weeks. Isabella is still feeling pretty sick from the chemo, but hopefully, those symptoms will start clearing up soon. Her appetite has been ok, but she hasn't been able to keep anything down, but they are pushing nutrition through her port. Below are some pictures from a visit from Annalise and Grandpa. So today we were moved to an isolation room in the pediatric unit. An isolation room is the same as a regular room except that everything was sanitized before we moved into the room. And by everything, we mean everything, as they wiped down all our stuff as well. Moving into the isolation room is in preparation for Isabella receiving her stem cells later today (Saturday). Also, her blood counts continue to remain steady, although the doctors expect them to drop within the next few days. The stem cells take about 7-10 days to travel through the blood stream to get to the bone marrow before they can start creating blood cells. So although she's not neutropenic yet (low white cells which make her highly susceptible to infections), she will be soon. During that time, all visitors will need to wear masks and gloves. Isabella is still doing amazingly well. She has thrown up a few more times, and earlier today she didn't eat anything. But later in the afternoon, she started asking for some stuff to eat, including some pudding and chicken noodle soup. Of course, she threw that up a little later, but at least her appetite may be picking up. Later in the evening, she ate some chinese fried rice and pizza and milk and so far has kept that down. Later on Saturday, we also expect a visit from Annalise and Grandpa so that should certainly cheer her up. Isabella also loves to participate in the many activities that the Child Life services provide here on the pediatric floor. 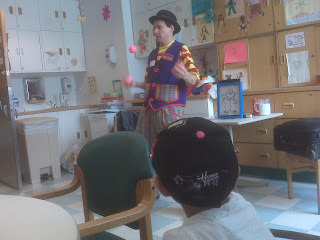 Two of her favorite activities are watching the clowns perform magic and music group therapy. Here are two pictures below. The first is Isabella watching Looney Louie do some juggling. 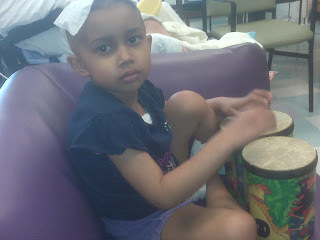 The second picture is with her in music group therapy playing some bongo drums. Today, Isabella got her last dose of chemotherapy, a three hour drip of thiotepa. As I wrote previously, although she is doing much better than in previous cycles, she has started to feel the effects of the chemo. She has vomited a couple times over the last couple days and her appetite has been reduced to almost nothing. Also, she is not yet neutropenic (low white cells count) and her other blood counts are still ok, but they continue to drop and we expect them to bottom out within the next few days. Today, she also started to feel more tired and did not want to do much. For the last couple of days, she would have the energy to walk around and take part in some of the playroom activities. But today, she didn't feel like walking and took several naps. So the plan for the rest of the week is to have a two day rest on Thursday and Friday. On Saturday, she is scheduled to receive her stem cells that we collected over the last couple cycles. This will help her blood counts recover. We will also be moved to an "isolation room" within the next couple of days in anticipation of her white counts hitting zero. An isolation room is simply a regular room that the nurses completely sterilize before we move into it. In addition, all visitors to the room (including the nurses, Julianne, and myself) must wear gloves, masks, and gowns. It should take about 10-14 days for her counts to start to recover, then, a few more days when we will be able to go home. So while we're excited to be done with the chemotherapy, we will be on edge for the next couple weeks as Isabella will be extremely susceptible to infection and her body's immune system will not be able to fight any infections. Since she won't be able to leave the room, we will also need to find a way to entertain ourselves in the room. Today, Isabella's creatinine clearance was normal so they continued with the third dose of carboplatin. They will check her urine again in the morning just to make sure her kidney functions are still ok. Isabella has started to feel some of the effects of the chemo, but her appetite is still ok and her energy is still good. She receives anti-nausea medication, which seems to help during the times when she starts to feel nauseous. In previous cycles, by now, Isabella would be vomiting several times a day and not have the energy to get out of bed, but that is not the case, at least so far. Also, the anti-nausea drugs would have little effect. On Monday, she will begin 3 days of thiotepa, a chemotherapy drug that she has not gotten yet. Since everything got pushed a day, she will probably not receive her stem cell transplant until Saturday.